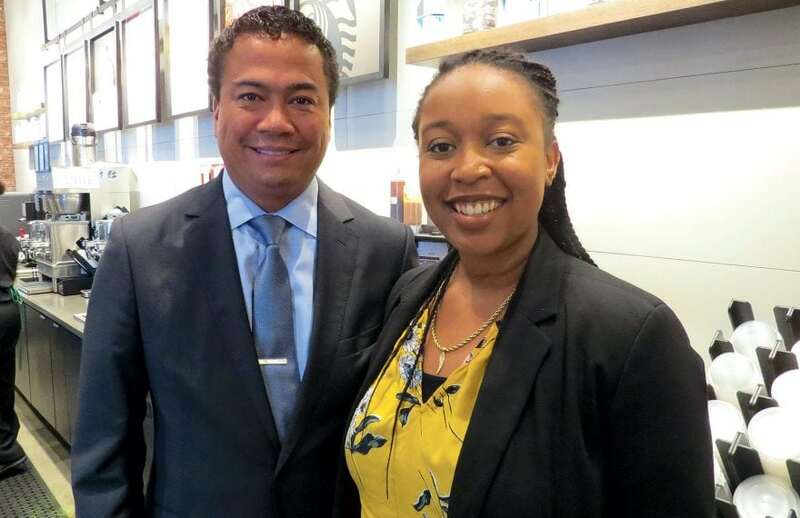 Mike Mathis, seen here with Anita Bird, assistant general manager of the Starbucks at MGM Springfield, says the $960 million initiative has gone from being a campaign and project to being an employer and operator. 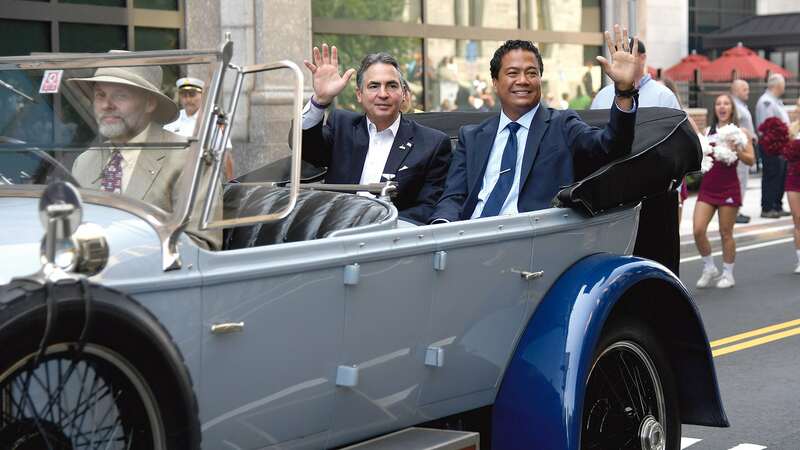 When Mike Mathis rode down Main Street with Springfield Mayor Domenic Sarno in the back of a Rolls-Royce (built in the city) on Aug. 24, it was the symbolic end to a journey that began nearly six years earlier. Or one stage of it, anyway. 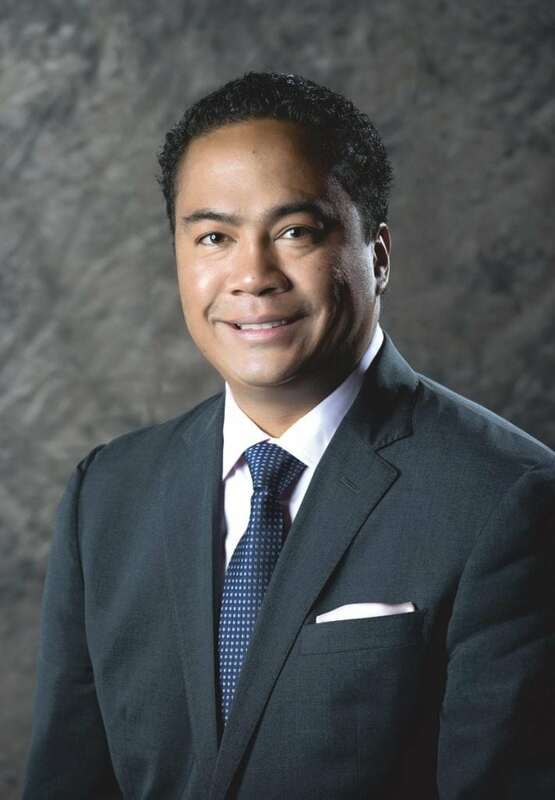 Indeed, Mathis, president and COO of MGM Springfield, made it clear that the journey continues, personally and professionally, as the casino works over the next few years to ‘hit its stride,’ as he put it. 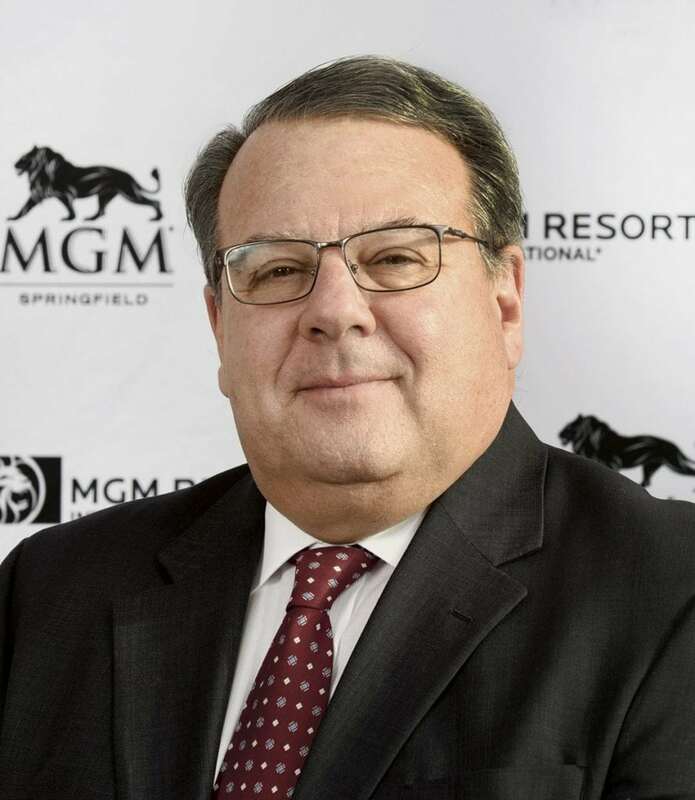 Mike Mathis said there were so many high points during the journey to opening the $960 million MGM Springfield that he was having some trouble listing and ranking some that stood out above the others. As for low points, well, he didn’t have any trouble at all with that assignment. 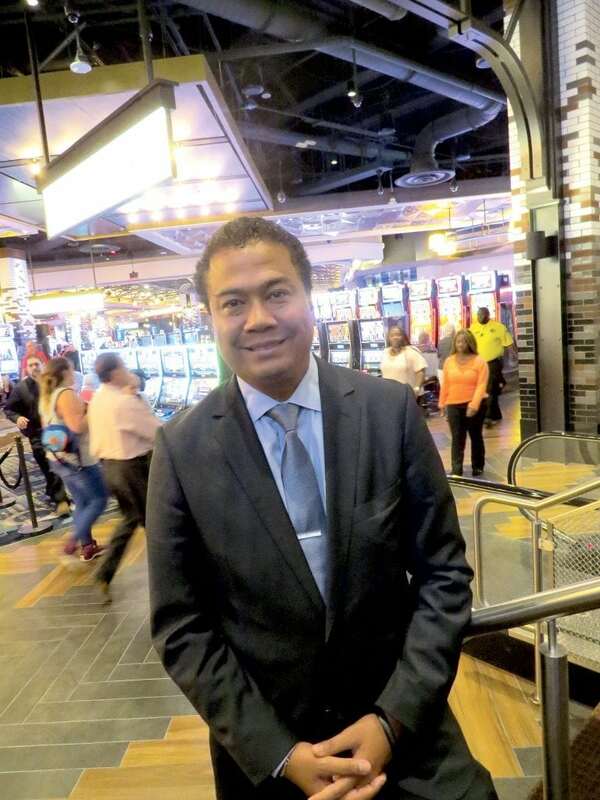 There was one stood out well above the others, and it brought with it some lessons — and humility — that served him well for the rest of the sojourn that climaxed on Aug. 24 when the resort casino opened, but is still very much ongoing. It came in the fall of 2015 as the design of the casino, and, more specifically, its hotel, changed considerably — from a 25-story glass tower that would dominate the skyline to a five-story facility along Main Street that would blend in. And especially at a hastily arranged press conference to announce the change and the days that followed. Mathis, named president and COO of MGM Springfield roughly a year and a half before that day, looked uncomfortable and quite defensive at that press conference, called after news of the design change leaked out in the local press and spurred a reaction he and others within the company were not prepared for after years of doing business in Las Vegas and other locales where such design changes aren’t really news, let alone confidence-shattering developments. 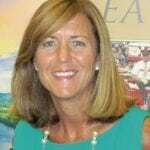 “Some of our naysayers took advantage of that and accused us of a bait and switch,” Mathis recalled. “Meanwhile, some of the folks that were more pessimistic about what our intentions were — despite years of goodwill I thought we had earned — seized on that moment. Elaborating, he said that he and his team members were all very visible in those days — and throughout the process — and some of those they greeted on the streets in the days following the announcement made their feelings known. 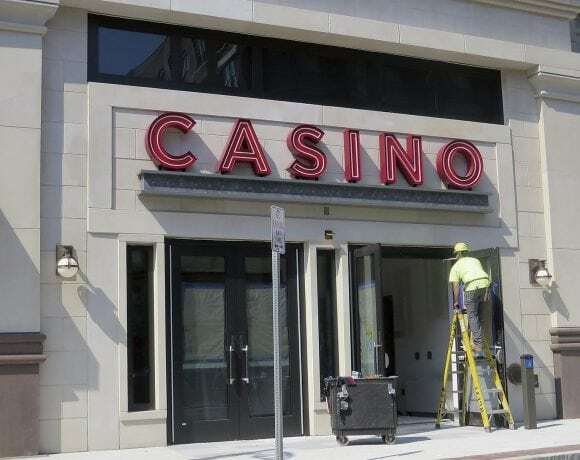 Indeed, and on Aug. 24, Mathis and Mayor Domenic Sarno shared an energetic high-five as they opened the doors to the casino complex just before 11 a.m., capping a six-year journey that actually began in Brimfield, not Springfield, as some may recall. Or at least the first part of the journey. 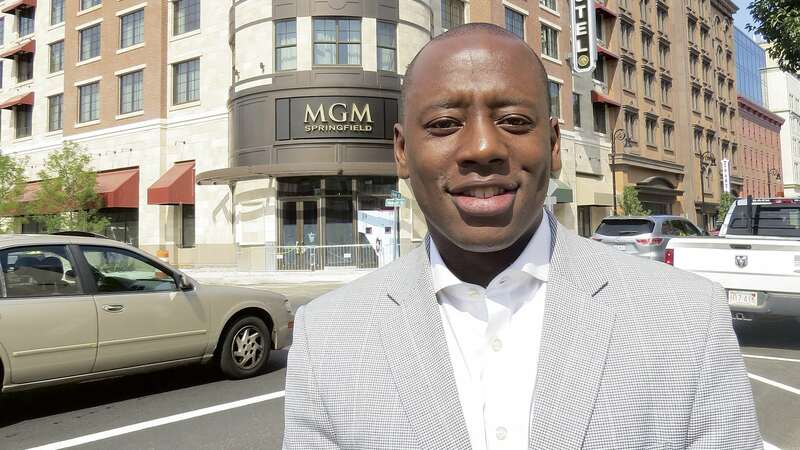 Building and opening the casino was obviously a long and difficult assignment, but it was just a step in the process, said Mathis, who told BusinessWest that MGM Springfield has gone from being a campaign and a project (one that officially ended on Aug. 24) to being an employer and an operator. And with that change, there are new responsibilities — for him and the team. 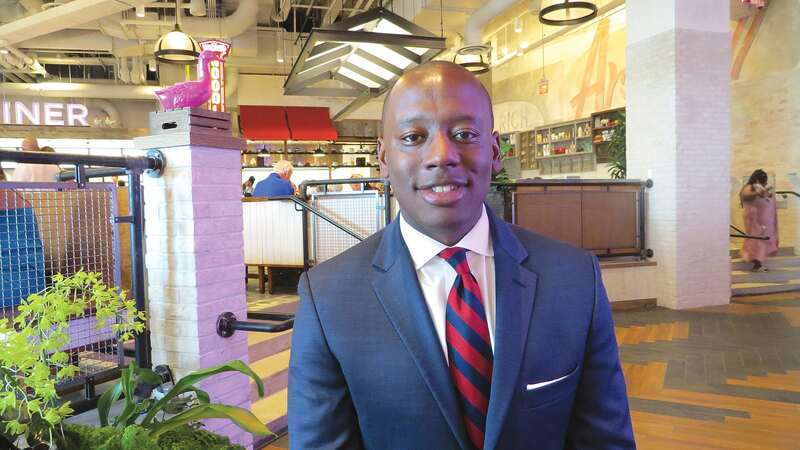 For this issue, BusinessWest talked with Mathis, clearly the face of MGM Springfield, about the journey he’s on — the parts have been completed and the ones still to come. 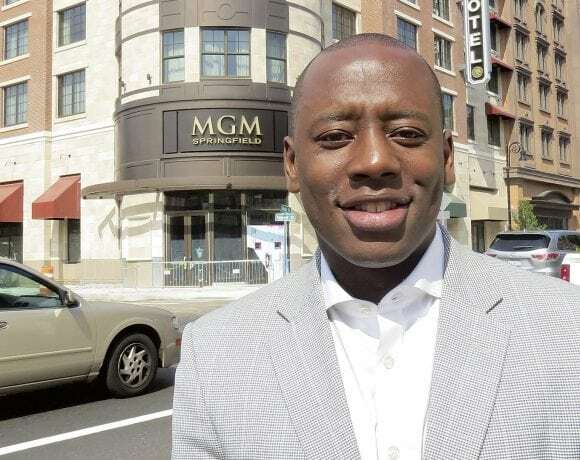 As noted earlier, when Mathis, then vice president of Global Gaming Operations for MGM’s hospitality division, first arrived on the scene in Western Mass. with the goal of helping the company win one of the coveted casino licenses in the Bay State, the focus wasn’t on Springfield, but tiny Brimfield. 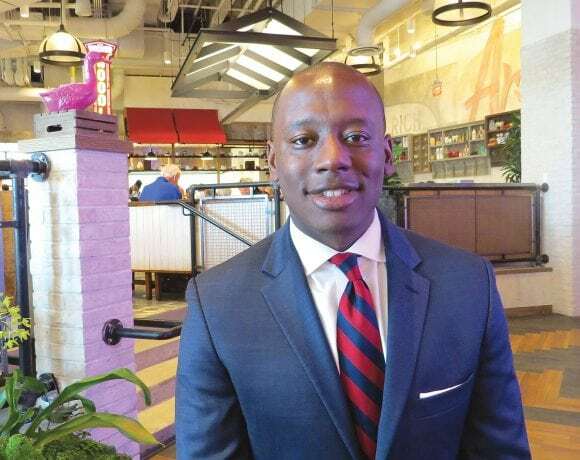 That’s where Mathis, who described himself as the “MGM advance Massachusetts guy,” first touched down and commenced learning all about Massachusetts politics, zoning, and more. 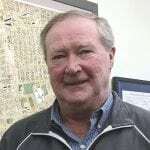 Eventually, he and the team would learn some other things — primarily that a Turnpike exit needed to make a Brimfield casino happen was not in the cards, as they say in this business, and also that Brimfield residents weren’t very responsive to the idea of having a project of this scale in their proverbial backyard. Mathis and the team at MGM would learn many other things in the weeks, months, and years to come, especially the fact that they were not in Las Vegas anymore, and that things move much more slowly in the Bay State. They also learned a lot about Springfield, which, in the early going, was emerging as a competitor to Brimfield. And the more they learned, the more they came to like the city and understand that whichever proposal emerged from the City of Homes would be a formidable candidate for the Western Mass. license. Fast-forwarding a little, by late 2013, MGM’s plan to place a resort casino in Springfield’s South End was the only Western Mass. proposal still on the table after voters in West Springfield and Palmer rejected casino referendums and officials in Springfield chose the MGM option over two others placed into contention. But still the fight wasn’t over, as MGM had to withstand a statewide referendum bid to ban casinos in November 2014, which it did, when 59% of voters gave the go-ahead to commence the casino era. All that was left now was to design and build the facility, staff it up, meet a host of conditions set by the city and the Mass. Gaming Commission, and eventually open the doors. 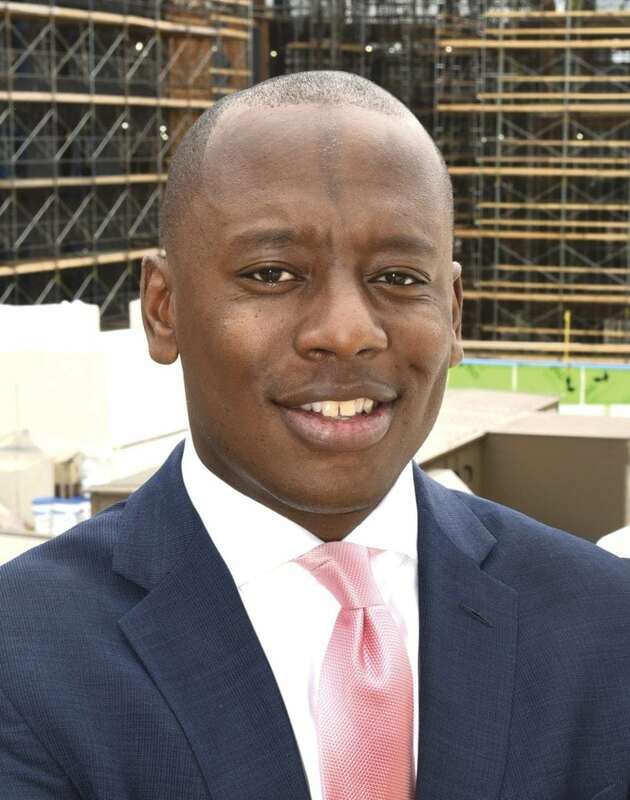 Mathis, of course, was involved in every step of the process, and he recalls it as the most challenging but ultimately rewarding experience in his career. As he looks back on that process, dozens, if not hundreds, of memories float to the surface — from attending neighborhood council meetings across Springfield to working with volunteers to summon the votes to defeat the ballot initiative on gaming, to visiting the Springfield Armory with MGM Chairman Jim Murren to learn about city history and architecture, and especially the influence of Frederick Law Olmstead, who designed not only Central Park in New York but Forest Park in Springfield. And, yes, that uncomfortable press conference when the design change was announced. 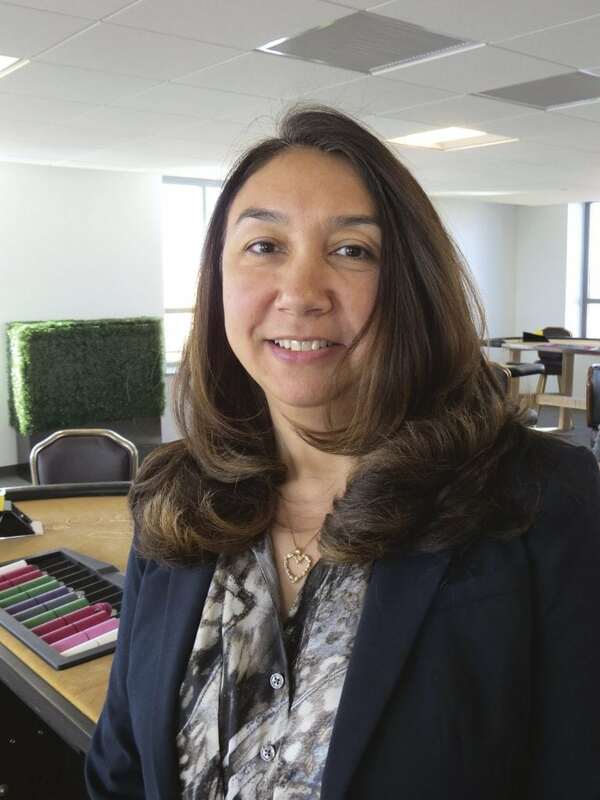 Early on the in the process, when Mathis was still on the advance team and not yet the face of the project, he recalls watching senior-management members as they worked to develop a relationship with Springfield and its leaders — and learning from those experiences. Actually, MGM doesn’t really do this all the time. It opened National Harbor in Maryland in late 2016, and another casino in Detroit a few years earlier. But it hasn’t opened many in this country, and hadn’t opened anything in the middle of an urban area like downtown Springfield. 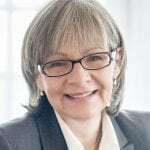 So this was a pioneering effort in many ways, and for Mathis, who had previously done considerable work for the company overseas, in locales ranging from Singapore to Toronto, it was, quite obviously, a significant career stepping stone to be put in charge of it all. To put that in perspective, he flashed back to the Gaming Commission session in early 2014 (he easily summoned the exact date, Jan. 24), when he was announced as the president of the project. 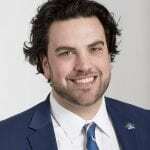 He said the biggest challenges involved with coming to a new market like Massachusetts is understanding the local population’s experience with gaming, and its wants, needs, perceptions, and fears. “We would go into neighborhood meetings and ask how many people had been to Las Vegas,” he recalled. 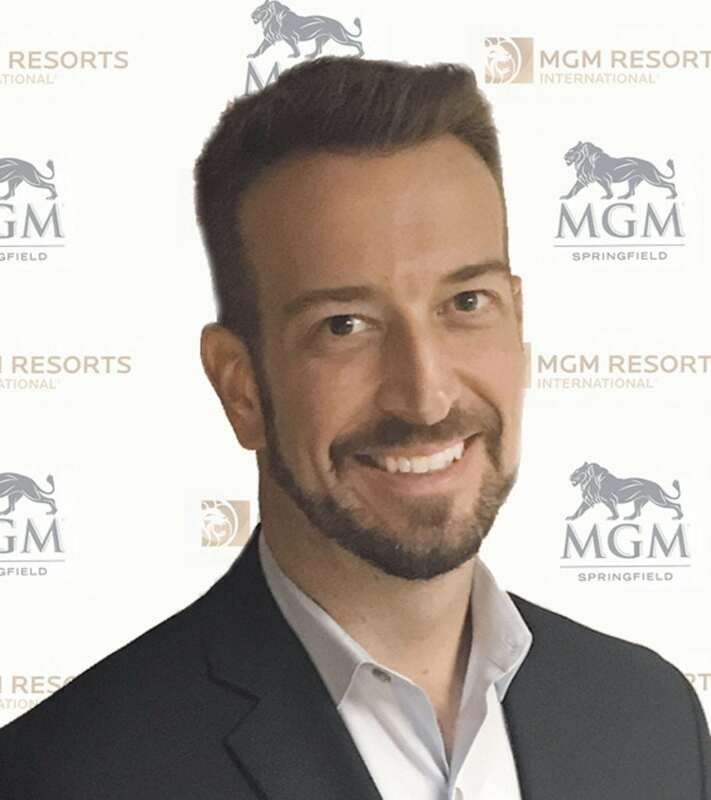 “And not many had, and that told me that, to the extent that they know gaming, they know it in a regional way, and they don’t know some of the great things we do in Las Vegas, a lot of which is MGM. Now that MGM Springfield is open, there’s been that shift he described, going from being a project to an operation. For him, the day-to-day is obviously much different, with a great deal of time spent on the casino floor. He said he will frequently engage patrons, asking them about their experience, their meal, and more. And many times, they’ll engage him because they recognize him from all those times he’s been in the news — and walking around the city, through the good times and the bad. That’s when happens when you’re the face of the operation. As for MGM Springfield as an operation, not a project, he said that, overall, it takes two to three years for a resort casino like this one to “hit its stride,” as he put it. When asked what comes next for him — a prolonged stay in Springfield, a new assignment in another corner of the world, or something in between — Mathis said he really hasn’t had any time to think about that. And with that, he went back to the casino floor to engage customers and be engaged by them. The journey has, indeed, been amazing, but in most all respects, this trip is far from over. 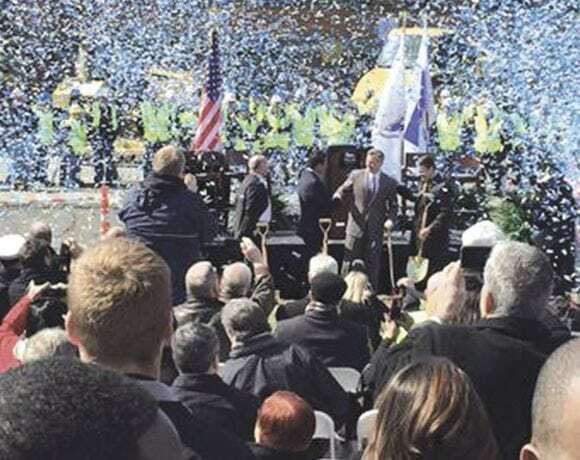 Editor’s Note: As the countdown to MGM’s grand opening ticks down to the final hours, we asked a number of area business and civic leaders for their thoughts on what this momentous development means for Springfield and the surrounding region. Richard Sullivan, president and CEO, Economic Development Council of Western Mass. “MGM presents an exciting economic opportunity for Springfield and Western Mass. Certainly the almost $1 billion investment in downtown Springfield, the construction jobs, and now permanent 3,000 new jobs are significant. 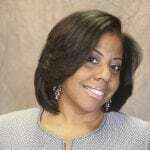 However, the real opportunity is the yearly $50 million purchase of goods and services from the existing local economy. MGM has worked diligently to fulfill this commitment. All of this investment will stay local and provide our local businesses an opportunity to grow. 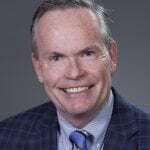 Jack Dill, president, Colebrook Realty Corp.
Editor’s Note: MGM’s opening on August 24 will cap a more-than-seven-year-long process of bringing a resort casino to Springfield’s South End. Here is a chronology of the events that brought us to this moment in Springfield’s history. Original designs called for a 25-story large glass-façade hotel; they were changed in late 2015 to include a five-story hotel along Main Street. • Nov. 2011: Gov. Deval Patrick signs “An Act Establishing Expanded Gaming in the Commonwealth,” allowing for up to three destination resort casinos located in three geographically diverse regions across the state, as well as one slots-only facility. The act states that the Commonwealth will receive 25% of gross gaming revenues, and also creates an independent body, the Massachusetts Gaming Commission, to oversee the implementation and licensing process. • August 2012: MGM formally announces its interest in a resort casino in Springfield. In fact, a total of three proposals for casinos emerge in the City of Homes — MGM, which targets the city’s tornado-damaged South End; Penn National, which proffers a development in the North End; and Ameristar, which hones in on the former Westinghouse site. • Dec. 2012: Ameristar withdraws its proposal for the Westinghouse site, leaving just two competing projects in Springfield. 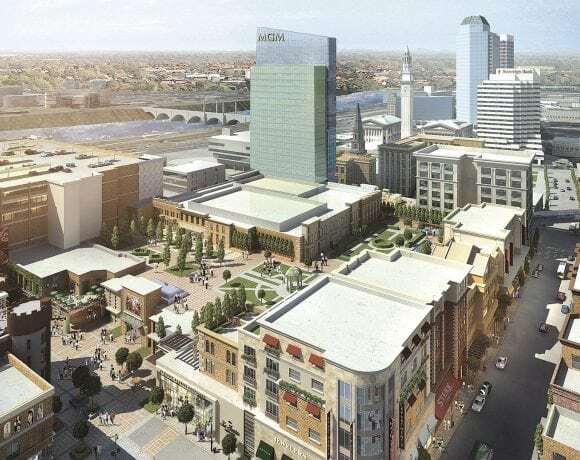 • April 2013: Mayor Dominic Sarno selects MGM Springfield as the winning proposal for the city of Springfield, ending Penn National’s bid in the North End. • July 2013: Springfield voters approve the casino project at a referendum, with 58% of voters in favor. The project is now one of three proposals competing to win the Western Mass. casino license, along with Hard Rock’s proposal in West Springfield, alongside the Big E fairgrounds, and Mohegan Sun’s proposal for Palmer, just off the Mass Pike. • Sept. 2013: West Springfield voters block the Hard Rock proposal, leaving only MGM and Mohegan Sun in the race for the region’s sole casino license. 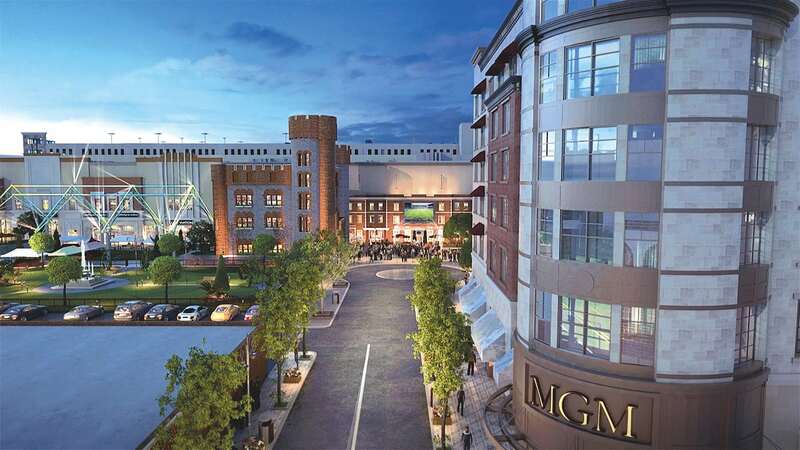 • Nov. 2013: Palmer voters follow suit, defeating Mohegan Sun’s project, leaving MGM Springfield as the only Western Mass. proposal standing. Had either Hard Rock or Mohegan Sun won voter approval, the Gaming Commission would have had to make the final decision — but the commission must still give the official go-ahead to MGM. • June 2014: The Gaming Commission unanimously votes to grant the Western Mass. license to MGM. The commission’s decision comes after an extensive, two-year process of hearings and background investigations culminating in a final week of hearings and deliberations. 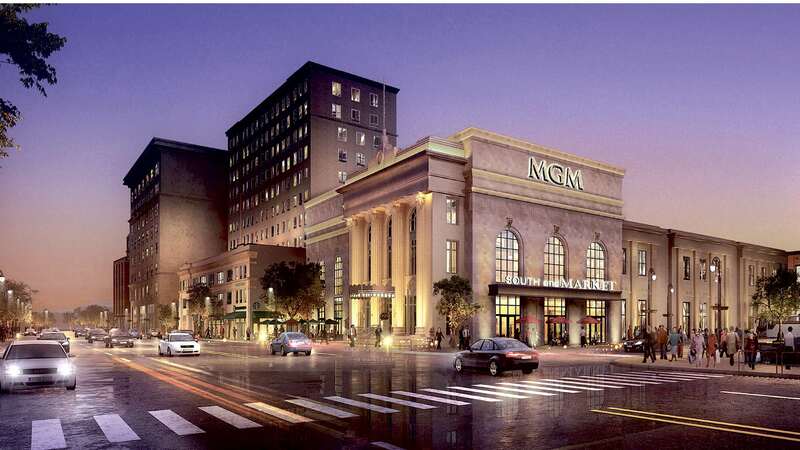 • Nov. 2014: The final roadblock for MGM’s development falls when a referendum attempting to ban casinos in the state fails, with more than 59% of voters giving the go-ahead to the Commonwealth’s casino era. 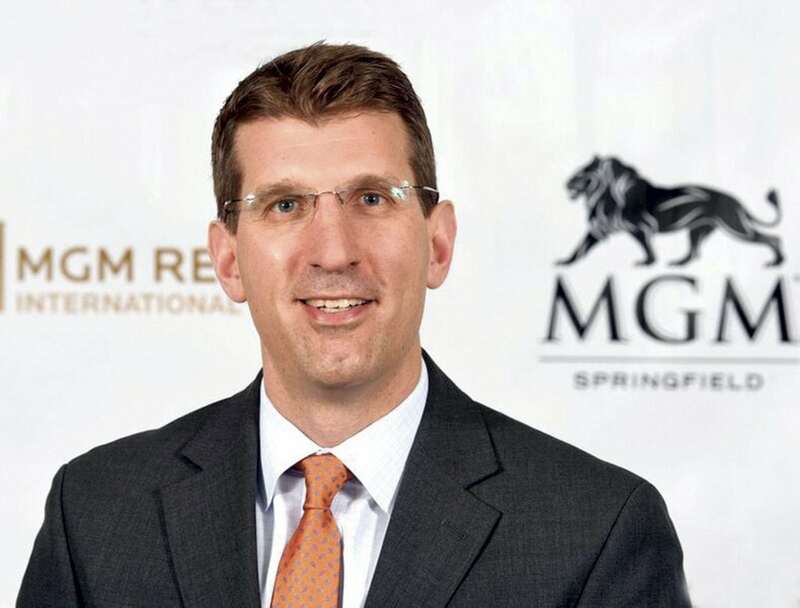 The four-year process of opening MGM Springfield begins in earnest, with MGM planning to create about 3,000 permanent jobs to benefit the local job market. 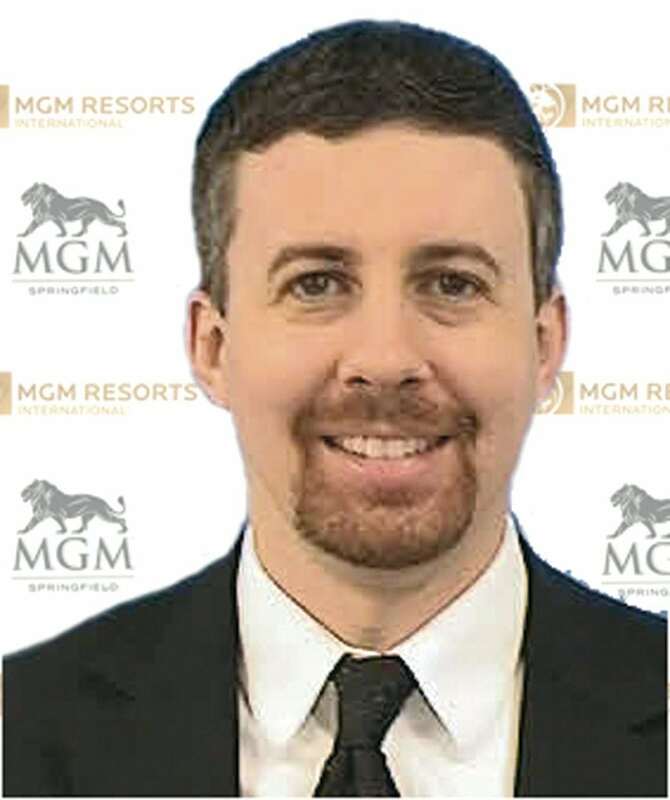 • Jan. 2015: MGM Resorts International names Seth Stratton vice president and general counsel of MGM Springfield. 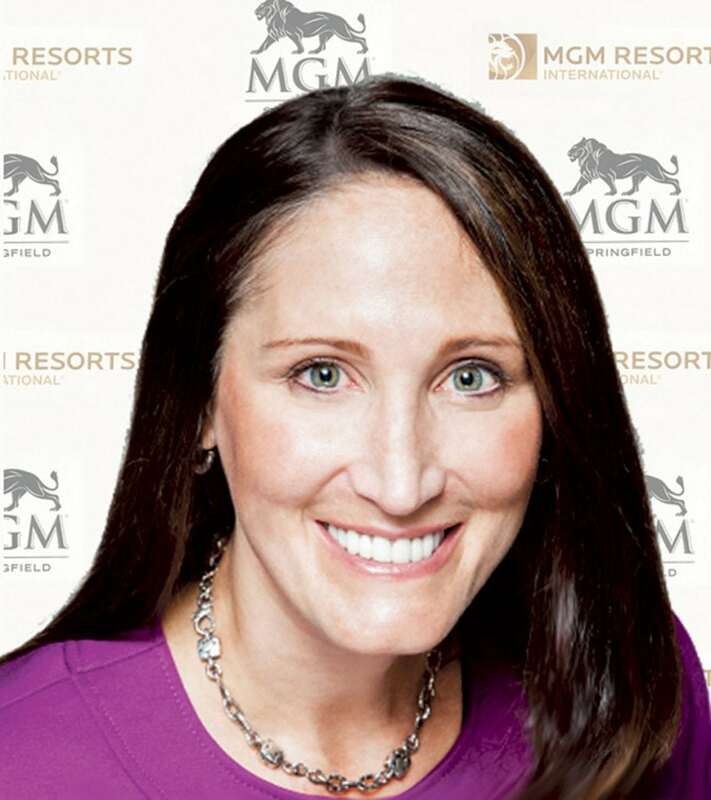 Stratton, a Springfield native and Longmeadow resident, is responsible for overseeing legal affairs and government relations at the casino resort. 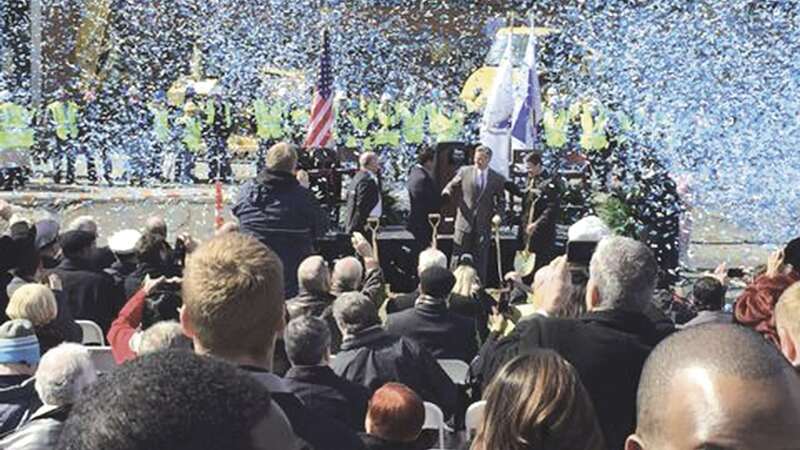 • March 2015: Brian Packer is named vice president of Development and Construction for MGM Springfield, and a groundbreaking ceremony is held at the site. • June 2015: Springfield officials announce that Springfield will coordinate the casino project in the South End with the multi-year reconstruction of the Interstate 91 viaduct through the city’s downtown, which will delay the opening until 2018. The original target date was late 2017. • Sept. 2015: MGM unveils a redesigned site plan for the project, abandoning the planned 25-story glass-facade hotel on State Street, in favor of a five-story hotel to be located on Main Street. The changes also include the reduction of the parking garage by one floor, and market-rate apartments being relocated off-site. 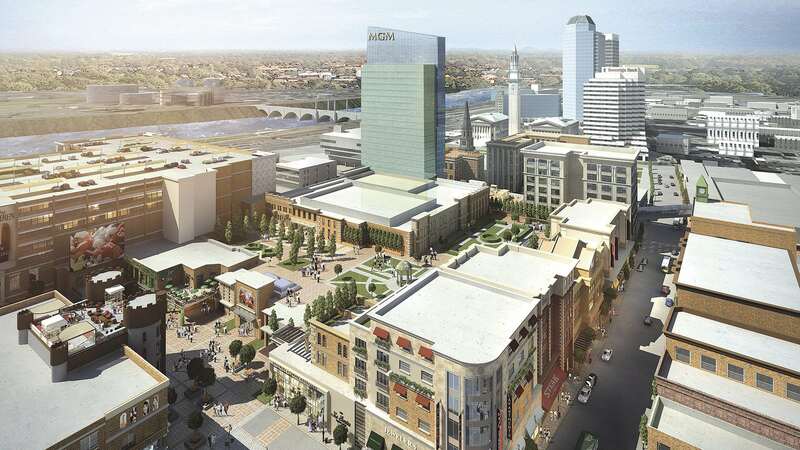 This rendering shows the revised design of MGM Springfield, with this view capturing the landscape on State Street. • Feb. 2017: MGM Springfield announces the terms of an agreement with the Massachusetts Convention Center Authority (MCCA) and Spectra by Comcast Spectacor to become the exclusive venue manager of the MassMutual Center. • March 2017: Hundreds of construction workers, city officials, MGM employees, and others gather at the future casino site to watch a crane raise the final steel beam into place in a topping-off ceremony. 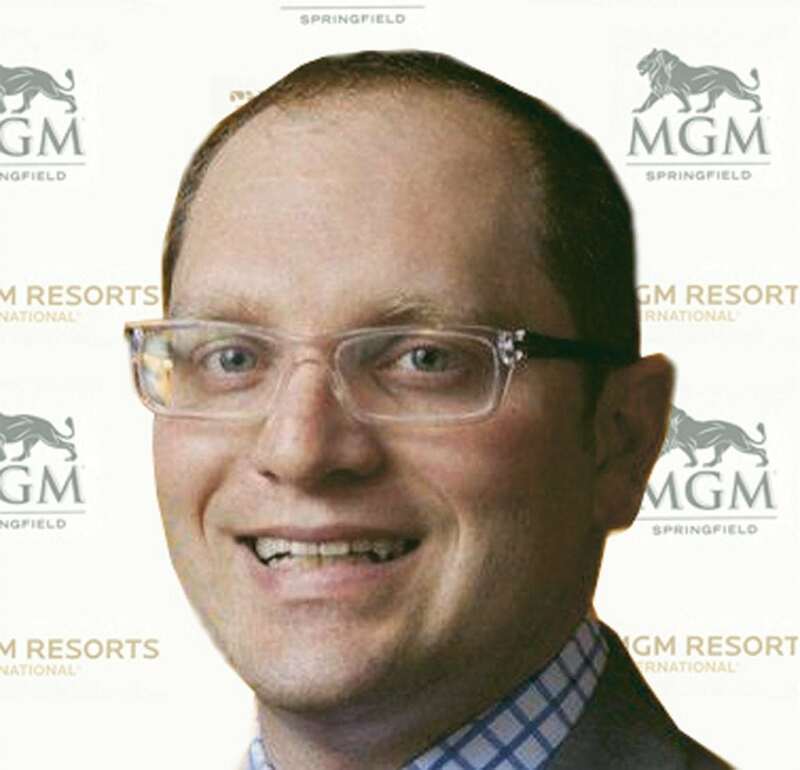 Alex Dixon was named general manager of MGM Springfield in the spring of 2017. 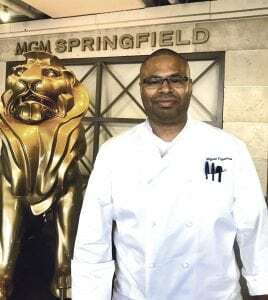 • Nov. 2017: The MGM Springfield Career Center officially opens for business, with mass hiring events commencing two months later — a period when most of the casino’s 3,000 employees will be hired. Under the host-community agreement, 35% of those employees will be from Springfield, and 90% from a combination of Springfield and the greater region. • Dec. 2017: The Massachusetts Casino Career Training Institute, a joint effort between Holyoke Community College and Springfield Technical Community College, opens, with classes launching in February. • May 2018: Passersby finally see signage for the casino and hotel, including the MGM Springfield sign atop the parking garage, highly visible from I-91. Meanwhile, a dome is raised atop the MGM Springfield hotel, just above the hotel’s presidential suite. 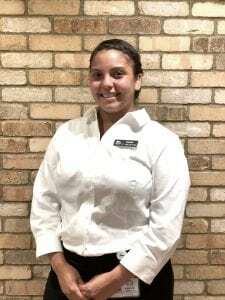 • June 2018: MGM Springfield hosts its final pre-opening hiring event, interviewing hundreds of applicants and hiring many of them on the spot. 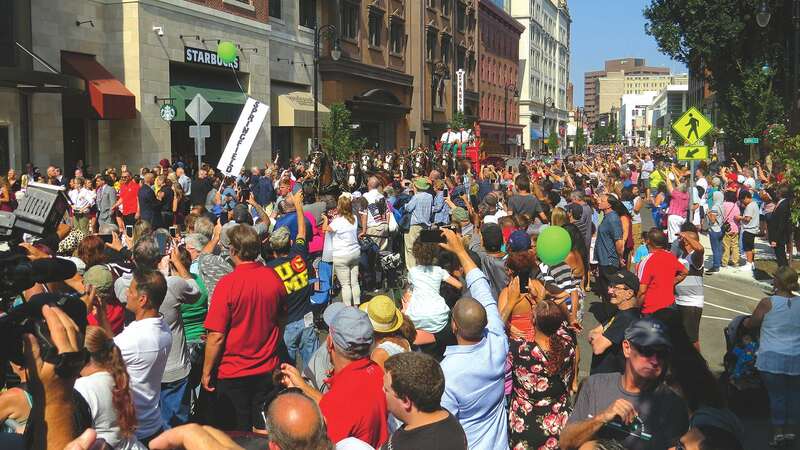 • August 2018: Plans are announced for MGM Springfield’s Aug. 24 grand opening, which will be preceded by a parade down Main Street at 10:30 a.m. from the corner of State and Main streets, featuring the world-famous Budweiser Clydesdales. The procession will arrive at MGM Springfield at 11 a.m., at which time the doors to the casino will officially open — never to close. For some, the contracts are truly life-changing, providing an opportunity to add employees, not cut back. For others, they amount to solid additions to the portfolio. In every case, though, status as an MGM vendor has brought with it a significant payoff. 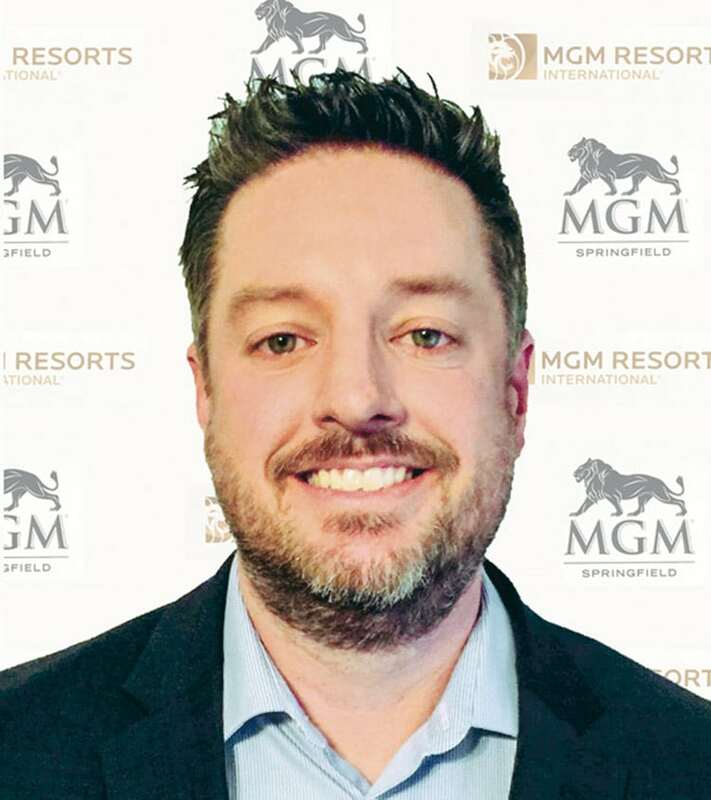 Dennis King says that only a few weeks ago, he was thinking about selling off some vehicles and downsizing; a huge contract with MGM has certainly changed the trajectory of his company. Dennis King says that, from the day MGM first set its sights on Springfield, he became focused on doing business with the casino giant. 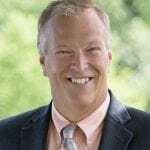 But he didn’t let this pursuit consume him, nor did he allow himself to get too excited, because, from the start, and to borrow a phrase from the gaming industry, King, president of Chicopee-based King Ward Coach Lines, considered himself a long shot. A real long shot. 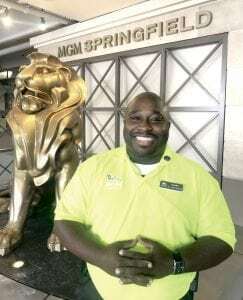 That’s because Peter Pan Bus Lines in Springfield is his main competitor, and, outwardly, he thought his rival was, to borrow a phrase from his own industry, more or less in the driver’s seat when it came to winning a coveted contract to provide a variety of services to MGM. So when he received that initial e-mail a few weeks back indicating that the casino giant would like to do business him, he stayed in his seat, but he was more than a little taken aback. The contract calls for King Ward to provide shuttle service from parking lots at the Big E to the casino the first few days it’s open, and also daily services (line runs) from Worcester, Brattleboro, Vt. (down through Hampshire County), the Berkshires, Holyoke and Chicopee, Hartford, and other Connecticut communities — three buses a day doing six runs. To say that this contract is huge — the word King used himself a number of times — would be, well, a huge understatement. Indeed, King, projecting that the opening of MGM Springfield would put a real hurt on the company’s line runs and charter service to the Connecticut casinos, Foxwoods and Mohegan Sun, and coupling that with not getting the MGM contract (which, again, was his prediction), was preparing to make cutbacks. 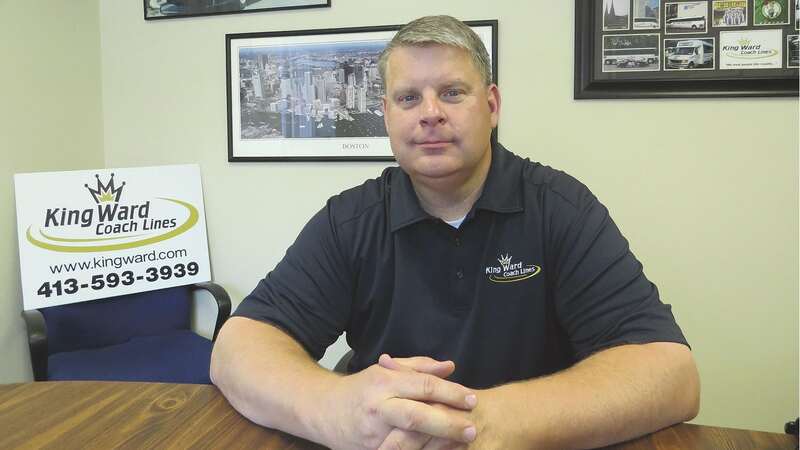 “I had intentions of downsizing my company, selling off vehicles and reducing staff, because Mohegan and Foxwoods are big destinations for us,” he told BusinessWest, adding that now, with this contract in hand, he has bought additional vehicles — vans to handle smaller groups travelling to the casino but also other destinations — and projects that he will have to hire a new dispatcher and several more drivers. 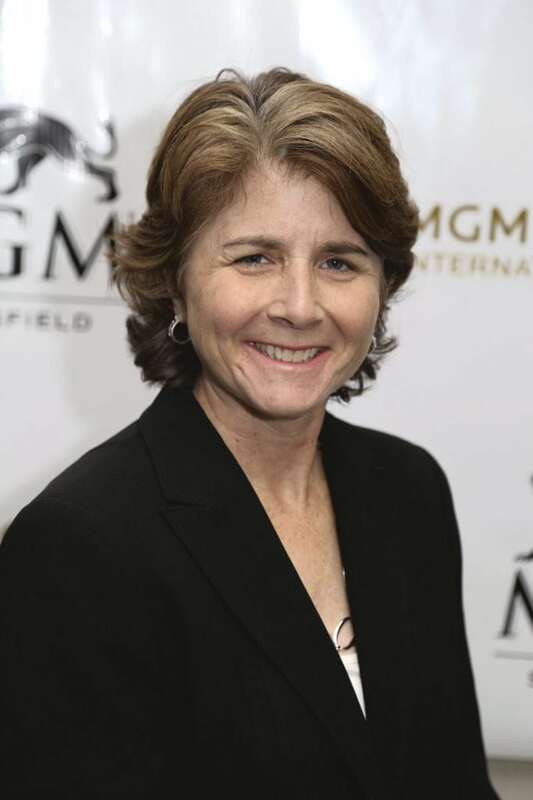 Thus, MGM’s contract is a game changer in every sense of that phrase, and King is certainly not alone in seeing his future altered in a profound manner. Rebeca Merigian can certainly relate, although the future is already here. 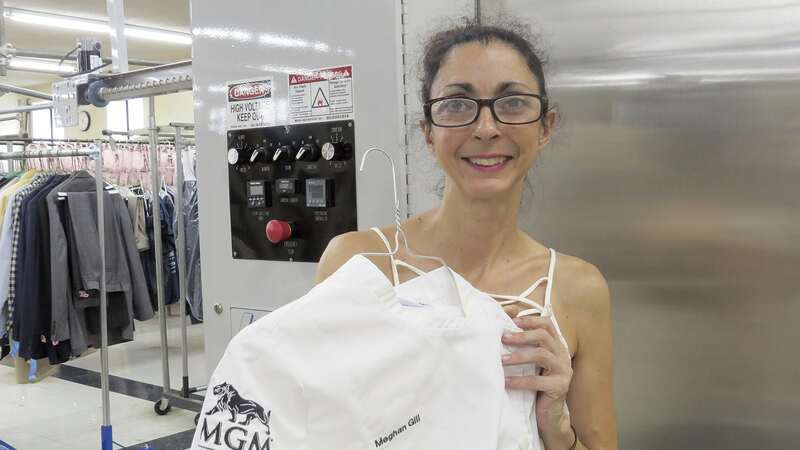 BusinessWest first caught up with her in April, when the ink was drying, figuratively but almost literally, on a contract for the fourth-generation dry-cleaning business she now owns to handle essentially every uniform to be worn by an MGM Springfield employee. Rebeca Merigian says that a year ago, the focus at Park Cleaners was on survival. A massive contract with MGM Springfield has changed all that, and prompted her to buy new equipment such as the steam tunnel behind her. 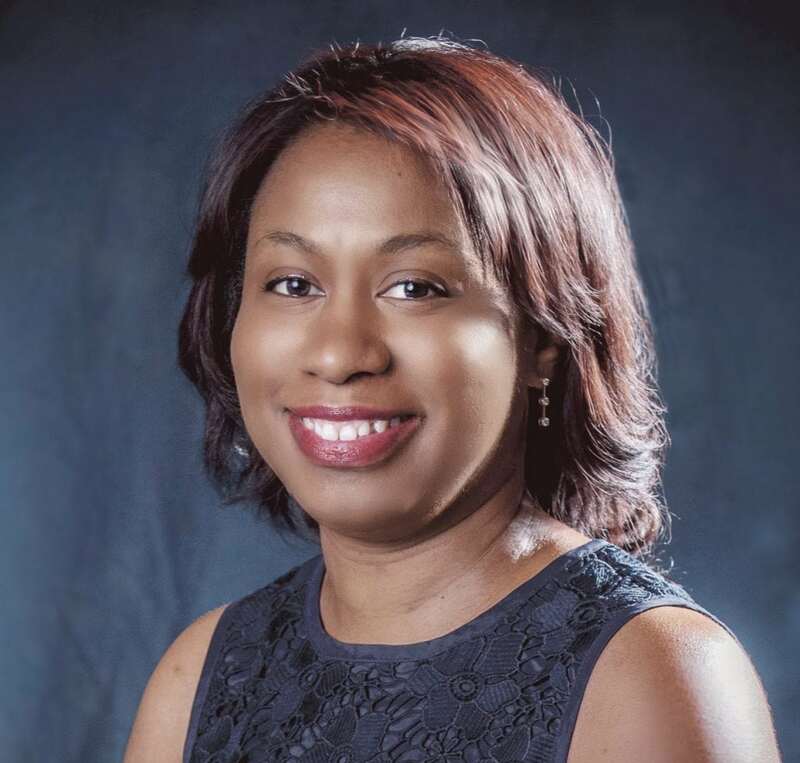 At that time, she projected that the contract would double the volume of business at a company that had seen little, if any, growth in years, and add a few bodies to the payroll. When we circled back recently, as work was coming in from the casino in ever-larger amounts, her predictions were coming to pass. Not every business owner that is now an MGM vendor is going to have the kind of life-altering experience that King and Merigian are enjoying, but for dozens of companies, MGM, which is expected to spend $50 million a year on goods and services from local suppliers, has become a very solid addition to the portfolio, one that will give their products exposure to thousands of people a day and to individuals from across the country and probably around the world. 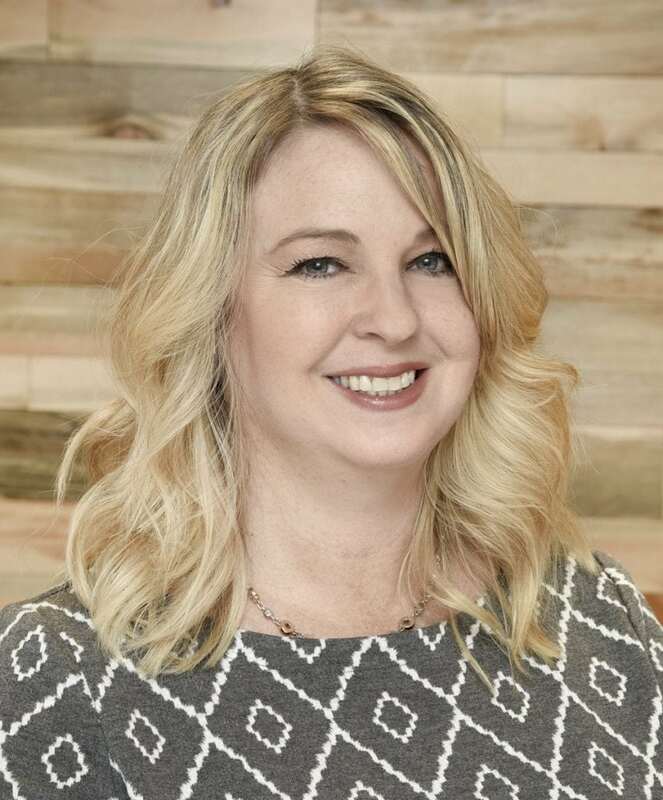 A partial list of these vendors includes a host of businesses, small and large, from brewers to produce providers; fruit-basket makers to a kitchen-supply outfit; a hand-dryer maker to a mattress manufacturer. 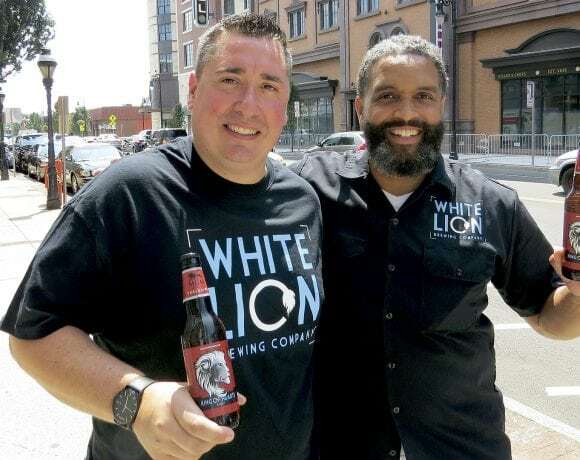 Some of the businesses, like Williams Distributing in Chicopee, have long histories, while others, like White Lion Brewery and the D-13 Group are startups or next-stage ventures. 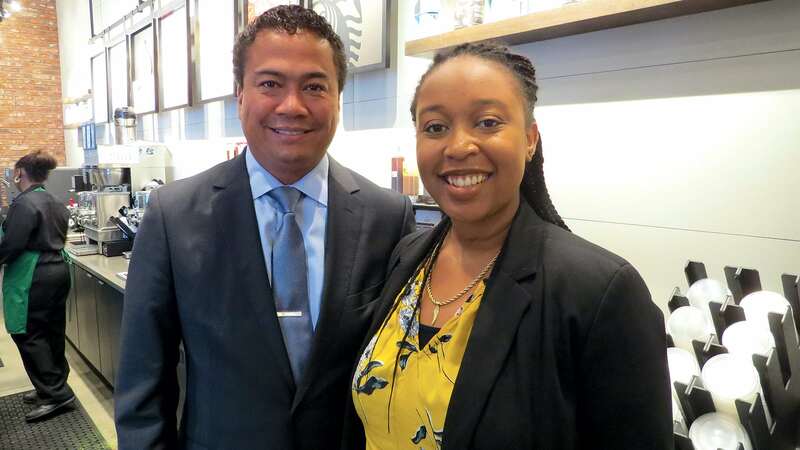 As the casino prepares to open in a matter of hours, not weeks or even days, BusinessWest takes another look at one of the more important aspects of MGM’s arrival — the boost to be received by a number of area businesses across a host of sectors. 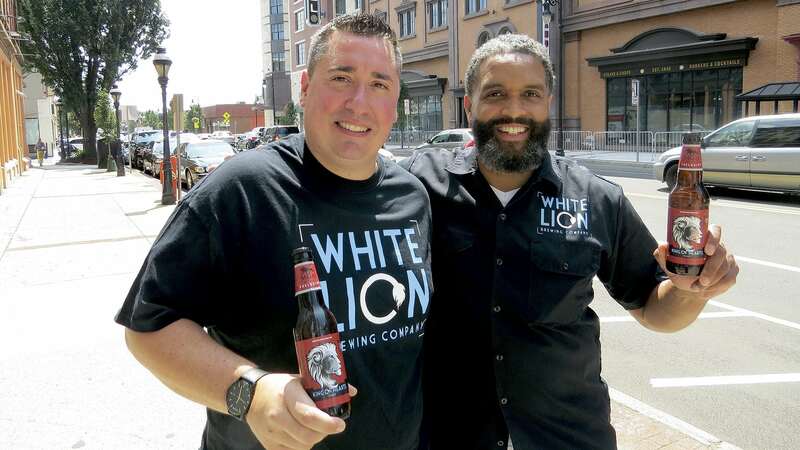 Ray Berry has already enjoyed a good deal of success with his craft beer label White Lion. Indeed, the brand has moved well beyond Western Mass., and is now statewide, having made deep inroads into the lucrative Boston market, with the north and south shores being the next targets. Ray Berry, right, with partner Bill Collins, shows off King of Hearts Lager, to be sold exclusively at MGM Springfield. But the contract Berry signed to provide MGM with an exclusive label, to be called King of Hearts Lager, is perhaps the most significant development in the brand’s short history because of the exposure it will provide. Berry said MGM and White Lion have been in discussions about doing business together for some time now. After the food and beverage lineup for the casino was finalized, that allowed the parties to take those talks to a higher level, with the focus on being creative, he noted. The result was King of Hearts Lager. Thus, the bottle has two lions on it — the White Lion logo around the middle, and the MGM Lion on the neck. People will only be able to drink this label at MGM, but, as Berry noted earlier, visitors to the casino — and up to 10,000 are expected each day — will be introduced to the brand and, hopefully, compelled to look for it at home. 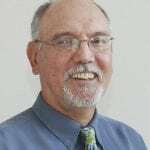 Bill Gagnon sounded a somewhat similar tone, only he was talking about a much different kind of experience — the one that takes place at the end of a visit to the men’s or ladies’ room. 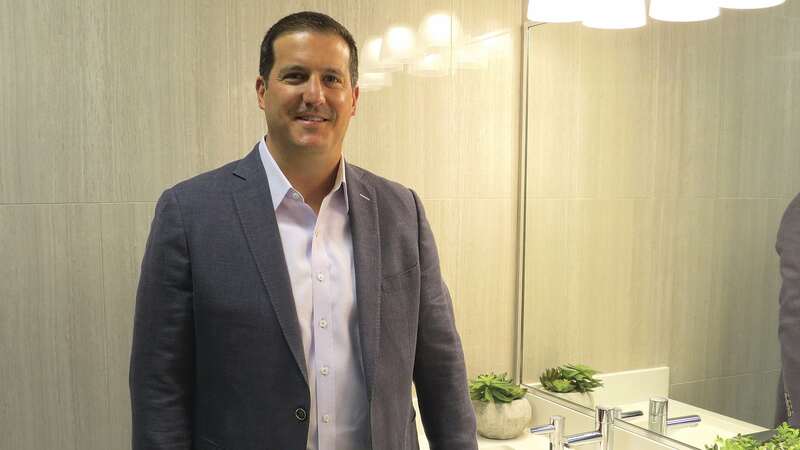 Bill Gagnon says MGM Springfield’s order for 96 integrated sink systems will generate some real momentum for D-13 Group, the startup venture he launched last year. 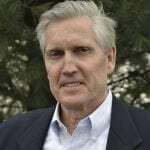 Gagnon is president of Natick-based D-13 Group, suppliers of Integrated Sink Systems, which, as that name implies brings a host of components together in one system, including the XLERATORsync Hand Dryer, produced in East Longmeadow by Excel Dryer, the company started and still led by his father, Denis. 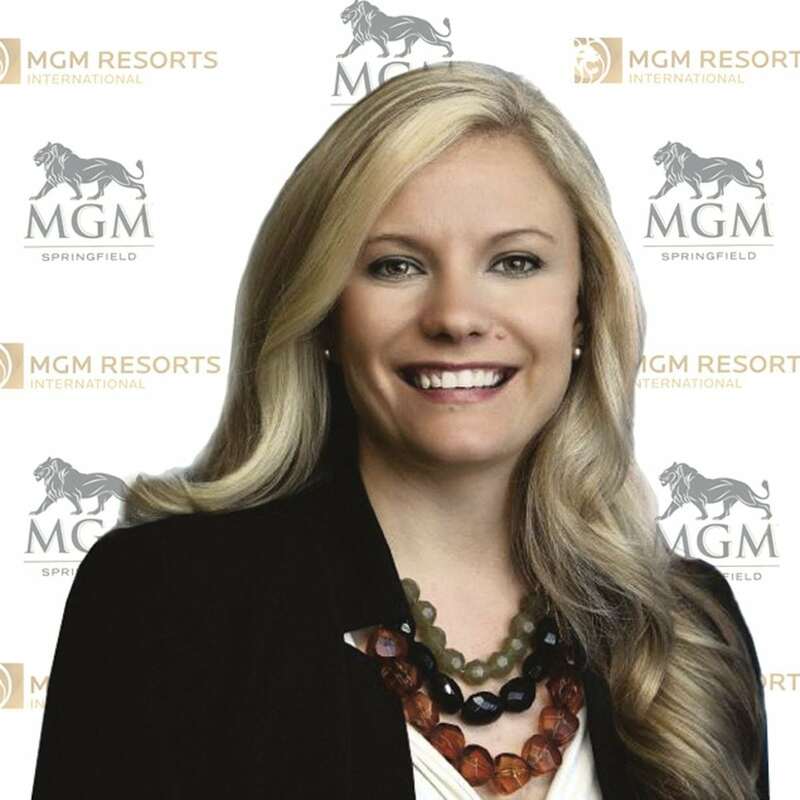 MGM has ordered 96 of the integrated systems for its restaurants, hotel, and meeting facilities, said Bill Gagnon, adding the company and its signature product are still just getting off the ground, and MGM’s contract provides a huge boost. The same could certainly be said for King Ward, the company started by King’s father, Robert, and partner Russ Ward. The venture turns 30 this year, and, as its president noted earlier, this wasn’t shaping up to be a great anniversary year. Indeed, the company had developed a very solid business taking individuals and a wide array of groups to the Connecticut casinos and especially Mohegan Sun — it’s a few miles closer than Foxwoods and, said King, that makes a big difference (Mohegan has been the company’s biggest destination) — and much of that business was generated from the Greater Springfield area. With the arrival of MGM Springfield, King was projecting that many of those customers would be gambling closer to home, and a decent number wouldn’t need a bus to get there. Couple that with not getting the MGM contract, and things were looking quite glum. But then, King got that e-mail from a consultant working for MGM who essentially started the dialogue that led to the contract. Things didn’t happen overnight, or even over a few nights, for that matter — there were some serious negotiations over specific routes — but the deal got done, as they say. 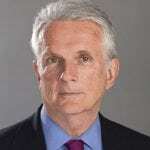 And it’s a huge deal for King Ward, which is located just a few hundred yards from the runways at Westover Air Reserve Base and has carved out a nice business dominated by charters to destinations ranging from the Bronx Zoo to Fenway Park. The contract provides a steady stream of income, said King, and the timing of many line runs — the buses drop off passengers at 9:30 and pick them up at 2:30 p.m. — allows the company to deploy its buses elsewhere during that stretch, perhaps for charters to MGM Springfield. “This is the biggest thing that will ever happen to our company,” he said. Rebeca Merigian could likely say the same thing. Park Cleaners has had big customers in the past, including MassMutual, but nothing like this. Each of the 3,000 MGM employees will have three uniforms, and Park will handle all of that. But there is also dry cleaning coming in from employees, and new business opportunities developing, such as work for the meeting facilities at the casino complex. The volume became so great so quickly — “we’re pushing about 500 pieces a day, and they haven’t opened yet” — the company bought some new equipment, specifically a so-called ‘steam tunnel,’ and has plans to add additional workers. 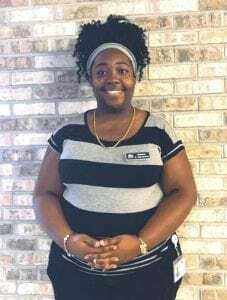 Regular customers are happier because the company is now open Saturdays and Sundays. 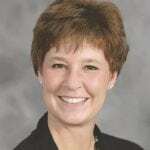 Meanwhile, the van the company has long used to make its deliveries is no longer sufficient, said Merigian, adding that among all the other things she’s doing, she’s researching 24-foot box trucks. All this represents quite a reversal of fortune. 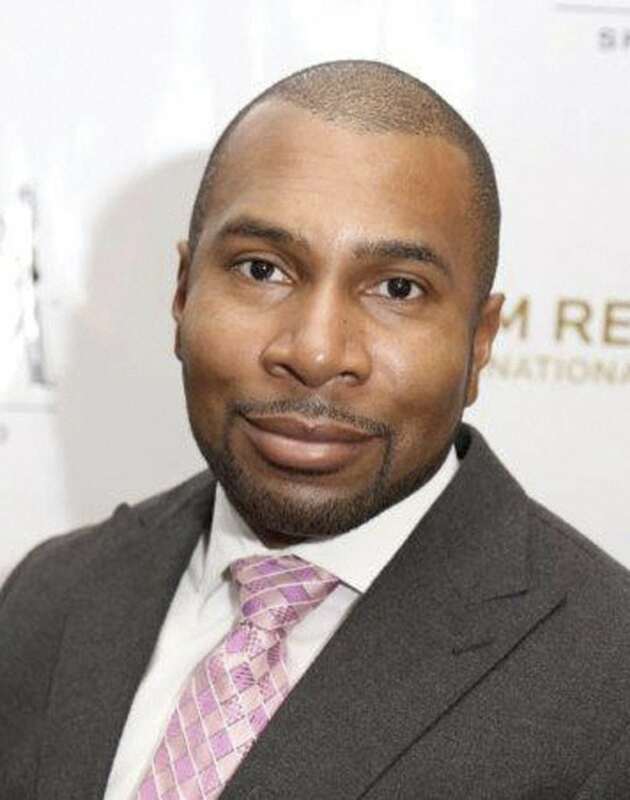 While a comparatively small company, King Ward had already made its mark in this region, becoming the transportation provider for a host of area institutions, ranging from Mount Holyoke College to the Springfield Thunderbirds. There are buses at the company’s terminal wrapped in those clients’ logos and colors, said King, and soon they’ll be joined by a few bearing the MGM lion. 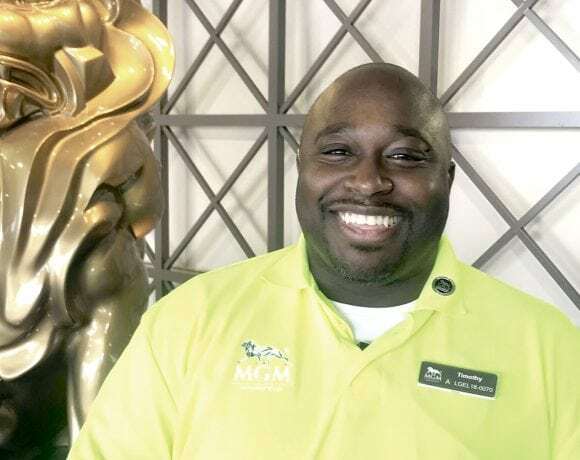 The company won’t be charging MGM for the cost of the wrap jobs, he noted, adding that this perhaps the least he can do for a client — and a contract — that has changed the trajectory of the company in, well, a huge way. There are a few other area businesses enjoying a similar life-altering experience, and for dozens more, MGM is providing a tremendous lift. 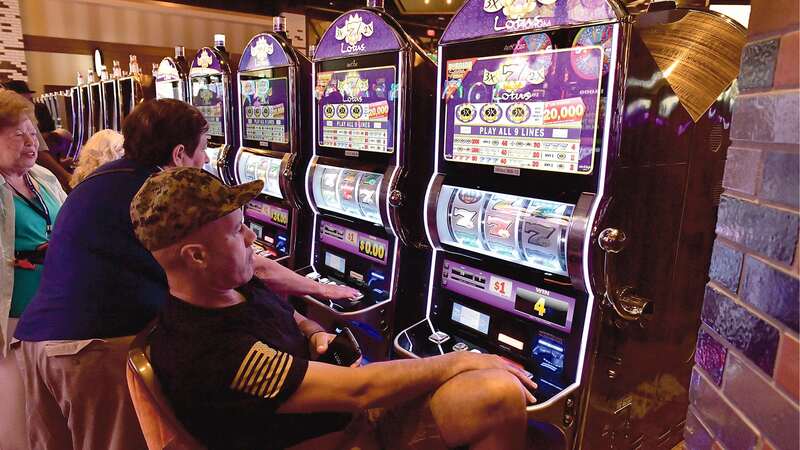 In a few days, visitors to the casino complex can dream about hitting the jackpot; several area businesses already have. The expansive 125,000-square-foot gaming floor will feature approximately 2,550 slot machines, 120 gaming tables, a poker room and high-limit VIP gaming area for a variety of experiences. • The boutique-style five-story hotel will feature 250 eclectic guestrooms inspired by the historic significance, iconic architecture and literary legacy of its urban surroundings. Each space is punctuated by details such as quotations from the works of Emily Dickinson and whimsical Merriam-Webster-inspired works of art. 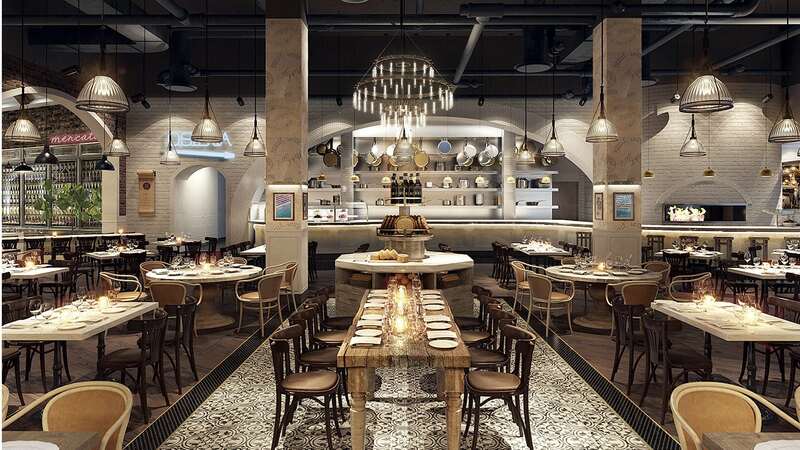 • Cal Mare: Award-winning celebrity chef Michael Mina will introduce a must-experience restaurant to the New England dining scene with Cal Mare, an Italian concept evoking the vibrant seaside elegance of Italy’s Amalfi Coast. With accolades including James Beard Foundation “Who’s Who of Food & Beverage” inductee in 2013, Gayot Restaurateur of the Year 2011, Bon Appétit Chef of the Year 2005 and more, Mina continues to dazzle the culinary world with bold dining concepts. 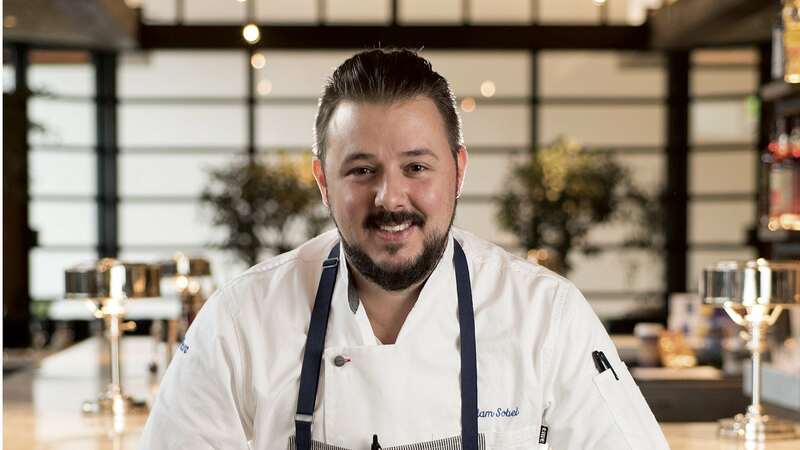 For Cal Mare, Mina and MINA Group are collaborating with San Francisco’s Chef of the Year Adam Sobel, for whom the concept has been a passion project for several years. Seafood from the Mediterranean and Pacific Ocean will be essential menu offerings, as well as fresh handmade pastas and brick-oven pizzas. Charcoal grilled fish, crudos and lighter Italian cuisine will inspire the restaurant’s colorful menu, while the beverage program will spotlight coastal Italian wines and an extensive list of Amari including house-made limoncellos and craft cocktails. • The Chandler Steakhouse: The name and location of The Chandler Steakhouse hold a special place in Springfield history. The restaurant is located in the former Union House Hotel — later renamed the Chandler Hotel — which was preserved as part of the development of MGM Springfield and incorporated into the new resort. 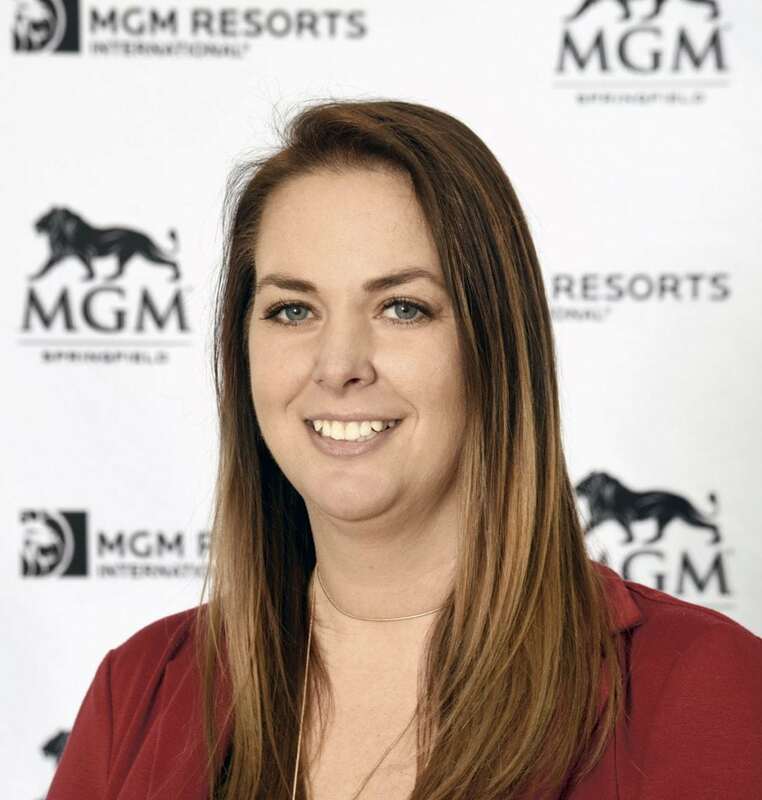 Guests will savor the finest seafood and steaks at The Chandler Steakhouse, which will be helmed by Hell’s Kitchen season-14 winner, Meghan Gill. The restaurant will offer cuts of meat made with 100% Midwest Angus beef that has been dry aged in-house for 21 days. 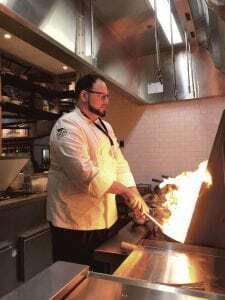 Guests will watch their dinner as it is prepared over an open mesquite charcoal broiler through a glass-walled kitchen serving signature dishes such as northwest salmon, whole steamed lobster or a tomahawk ribeye. • TAP Sports Bar: Building off the success it found at MGM Grand Las Vegas, MGM Grand Detroit and MGM National Harbor, TAP Sports Bar will make its mark on downtown Springfield. TAP will feature a 10-lane bowling alley, arcade, and beer garden, and fans can keep up with live game action on state-of-the-art HD TVs, as well as a massive video wall featuring 32 screens that can operate individually or as one giant image. Hundreds of hand-selected, vintage memorabilia pieces will be displayed prominently in the bar and dining areas, all carefully chosen to represent the surrounding area’s deeply rooted sports history. Adjacent to the sports bar, TAP’s arcade and bowling alley will be energetic and eclectic gathering spots for gaming, drinking and socializing. The space also will house a playful area featuring vintage video games, billiards, shuffleboard, air hockey and foosball. TAP will serve up Springfield-inspired menu items, including TAP’s Hall of Fame Burger, signature wings and Reubens. Beer aficionados will appreciate the vast varietals on tap and draft at TAP’s beer garden, which also will showcase local brewery partners. 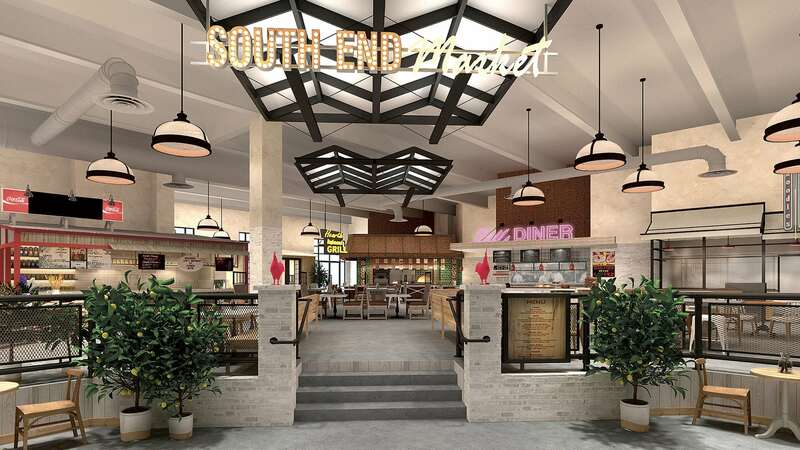 • South End Market: Adding a gourmet twist to the classic food hall, the bustling South End Market will feature a variety of quick-casual dining spots. Located off Main Street, the Market will house Wicked Noodles, a pan-Asian restaurant; Jack’s Lobster Shack, offering lobster rolls and New England-style clam chowder; an all-American eatery at Bill’s Diner; and healthy options at the Hearth Grill. Additionally, guests will be able to sit and sip at a Wine & Cheese bar or satisfy their sweet tooth at a Gelato & Espresso counter. 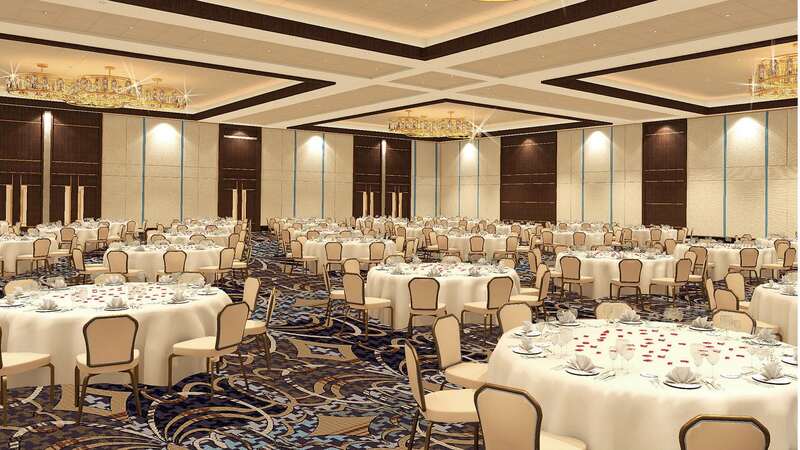 In addition to large-scale convention capabilities at MassMutual Center, MGM Springfield will offer approximately 34,000 square feet of space to accommodate meetings and events ranging from business to social gatherings. The meeting and event center will feature ballrooms, meeting rooms and boardrooms adjacent to a 6,200-square-foot outdoor terrace that will flood pre-function areas with natural light. All meeting spaces will incorporate sister property names highlighting the resort’s connection to other top destinations around the country: The 10,600-square-foot ARIA Ballroom; 5,600-square-foot Bellagio Ballroom; 1,000-square-foot Borgata Meeting Room; and the 1,000-square-foot Beau Rivage Boardroom. For larger groups, the nearby MassMutual Center offers 100,000 square feet of large-scale event space. 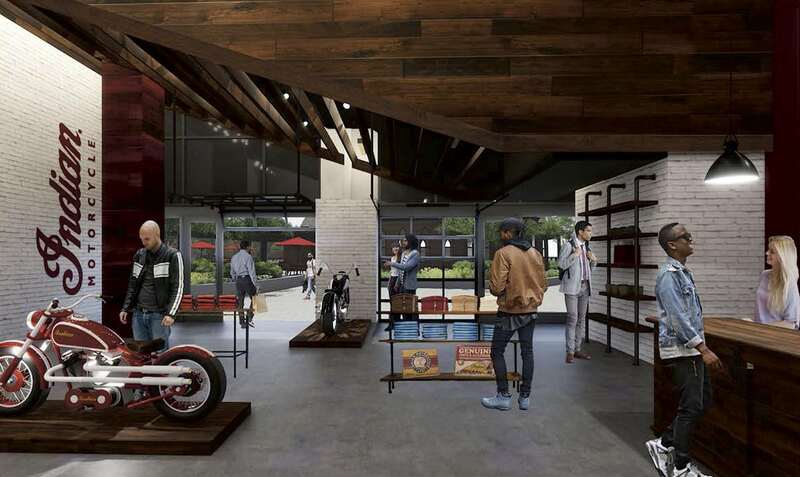 • Indian Motorcycle: The Springfield-born pioneers of the American motorcycle industry, will debut the brand’s first-ever apparel store as an anchor tenant of MGM Springfield. retail collection. The store will offer items from the brand’s casual apparel line, the Indian Motorcycle 1901 Fashion Collection, which includes graphic tees, sweatshirts, hoodies and jackets inspired by Indian Motorcycle’s rich heritage. Indian Motorcycle jewelry and accessories also will be available for purchase. Mirroring the aesthetic of the store’s product lines, the space will feature an industrial-yet-modern vibe with exposed, vaulted ceilings and concrete and wood elements. •Hannoush Jewelers: Founded in Springfield in 1980, Hannoush Jewelers is a family-owned and operated business. 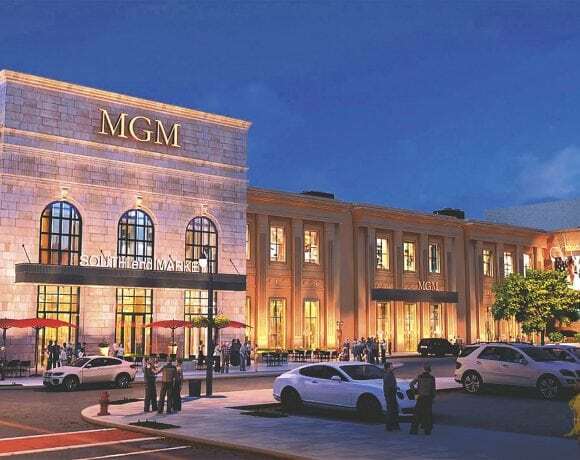 The MGM Springfield location will be a flagship for the expanding brand that boasts more than 50 locations throughout Massachusetts. Guests can expect to find pieces from sought-after designers such as Tacori, Breitling, Alex and Ani, Pandora and more. • Kringle Candle: Kringle Candle unites heritage and innovation in its signature line of all-white, ultra-fragrant, pure-burning candles. The Springfield boutique will be situated in the First Spiritualist Church space (a historic High Victorian Gothic church that was literally lifted from its foundation and relocated approximately 600 feet to its new permanent home). It will draw inspiration from Kringle Candle’s thriving Bernardston shopping destination, featuring candles, eclectic gifts, keepsakes and chocolates alongside a gourmet café offering sandwiches, salads and pastries for breakfast, lunch, or dinner. Guests can tee up at MGM Springfield’s Topgolf® Swing Suite, a new social gathering spot featuring high-tech immersive golf simulators and a lively lounge with delicious food and beverage offerings. The resort also will feature an eight-screen movie theater complex; 10-lane bowling center; serene spa; and an 8,000-square-foot pool situated within a terraced rooftop garden. Inspired by the classic New England town common, MGM Springfield will create a lively outdoor plaza and thriving public space, with the iconic 19th century Springfield Armory at its center. The historic United States arsenal will provide the backdrop for the open-air marketplace, which will feature live events, local artisans, farmers markets and seasonal programming including an outdoor ice rink. The plaza will become the anchor for the neighborhood’s pedestrian crowd, encouraging guests to explore the many local businesses and attractions nearby. Woven through all elements of the resort, a public fine art program inspired by the industrial ethos of Springfield will feature a captivating collection of commissioned and hand-selected pieces by international and local artists from Springfield, the greater Berkshires, New England and beyond. The property also will feature an exclusive exhibit, “Cabinet of Curiosities: Springfield Innovations from the Springfield Museums,” curated in partnership with the Springfield Museums to showcase turn-of-the-century objects throughout the resort, such as a 1925 Edison Western Union Stock Ticker, a 1915 Springfield-made Telegraphone, and an 1895 Edison Home Phonograph. This means a lot. It solidifies that I have made it far, and my hard work has paid off. Running this operation means the world to me, and gives me a sense of pride. Leading one of the outlets the casino has is the ultimate goal as a chef. It separates the good from the great. I feel like I have arrived. Working here allows me to be me. I’m fun-loving, outgoing, and I love life. This is who I am. I appreciate MGM for giving me this opportunity. It’s dear to my heart. Being chosen to be a part of this family is very special, and I get to embark on this journey of my life. Because I’m from Springfield! I heard about this property since the beginning. I went to Boston for five years, I gained experience, and as soon as I knew that this was real I knew it was my opportunity to come back. I know what MGM Springfield means to the area, I’m aware of where this city has been, and excited about where it is going to be very soon.